Progressives want Maine to vote on another tax hike. This time it would pay for home care. 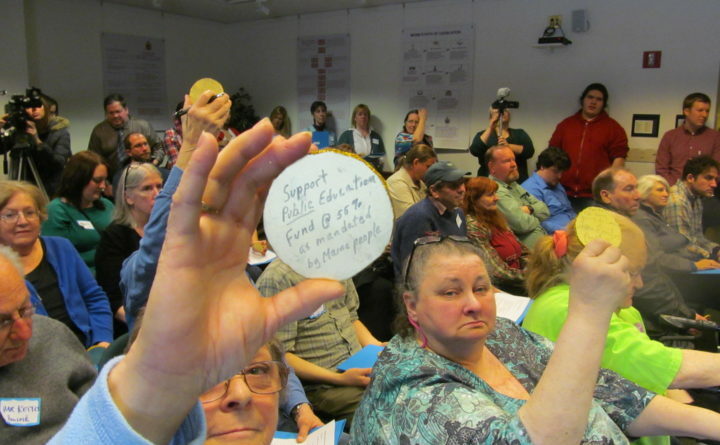 Supporters of the Maine People's Alliance gather in Augusta in a March 2015 file photo. A citizen-initiated referendum campaign being launched Wednesday would add a Maine payroll tax to help elderly and disabled Mainers pay for in-home support services regardless of their incomes. Mike Tipping, a spokesman for the Maine People’s Alliance, said the goal is to gather the required 61,123 signatures of registered Maine voters by early next year and put the question on the November 2018 ballot. The new Home Care Universal Trust Fund that the initiative would create would provide daily living services for people older than 65 and people with disabilities, regardless of their income. It would be funded by funneling payroll taxes for employees who make more than $127,200 annually. Employees and employers would both contribute a sum equal to 1.9 percent of the employee’s income, for a total of 3.8 percent. Tipping said that would generate approximately $132 million a year. The effort is sure to re-ignite a battle that raged through 2016 and the first half of this year over last year’s Question 2, which raised the tax on income over $200,000 to benefit public schools. That initiative passed with about 50.5 percent of the vote but was later repealed by the Legislature, which instead appropriated $162 million in new education money in a two-year state budget bill. Jason Savage, executive director of the Maine Republican Party, said the new referendum would be disastrous to the economy if it is approved. Tipping said the point of the new referendum is to target taxpayers who would have been paying the 3 percent surtax if it weren’t repealed, and who have enjoyed income tax cuts under Gov. Paul LePage. In addition to providing funding for people who need the services, Tipping said the referendum would provide new support to their families and loved ones as well as the direct-care industry through new funding for training and higher wages. The initiative comes as the number of Mainers older than 65 is poised to double by 2030, said Tipping. The initiative was scheduled to be formally announced during a Wednesday morning news conference in South Portland.